Braised beef short rib chili, served with creamy polenta and spicy coleslaw. There is nothing traditionally Texan about this chili, but living in Texas definitely led to its inception. I typically make this around football season, but the rodeo had me thinking about Texas foods. The Houston Livestock Show and Rodeo just left town, and in honor of its exodus, I cooked a batch of chili. It’s a version I’ve been making that is inspired by living in Texas, but it is definitely not “Texas chili” by any purist’s standards. In a roundabout way, it was Texas barbecue that opened my mind to the possibilities for chili, more specifically the benefits of slow-cooked beef. I’m a Midwesterner, so I have some experience with the provincial oddities and kitsch that accompany state fairs. Even so, I was still surprised at the spectacles and excesses of the rodeo. My initiation to the rodeo actually happened with a surprise. Years ago, on a Saturday morning, I woke to what I thought was a maniac loose on the street, screaming beneath my window. However, when I pulled up the blinds, I saw a stream of riders on horses and wagons, while an emcee in cowboy gear announced their names through a microphone. It was then I discovered I was living at the epicenter of the rodeo parade route. The biggest surprises were still in store for me when I actually attended the rodeo. The runner-up has to be the chicken fried bacon, a delicacy out of Yoakum and Snook, Texas. Yes, I did eat it gratefully. But the blue-ribbon surprise goes to mutton bustin, an honorable tradition of putting toddlers in hockey helmets and life jackets and then placing them on sheep to see how long the kids can hold on while the sheep run. I remember a lot of tears and a lot of bewildered joy. 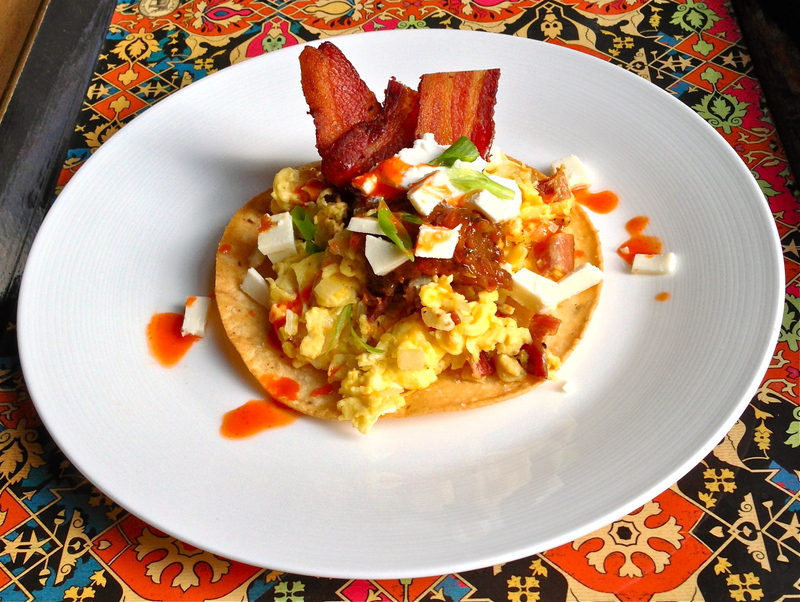 Breakfast tostada with eggs, bacon, onions, queso fresco, scallions, salsa, sour cream, and Cholula hot sauce. Since I had the dutch oven out to make the chili, I decided to fry corn tortillas for breakfast tostadas before the afternoon of chili preparation. Moving to Texas was full of cultural discoveries like these, many of them inspiring ambivalence like my rodeo experiences did, yet, there were some unequivocally enjoyable surprises, like breakfast tacos and Texas barbecue. In Minnesota, if Mexican food was served for breakfast, it was usually some version of a bland flour tortilla rolled around eggs and cheese, dolloped with store bought salsa. Barbecue meant bratwurst and hamburgers if you were at home or the cabin. If you went out to eat, you might get pork ribs or chicken. I didn’t even know what beef brisket was before moving to Houston, and I regret all of those lost years. Same goes for real tortillas, flour or corn, and the genius of mixing eggs, salty meats, and cheese together to serve with those tortillas for breakfast. 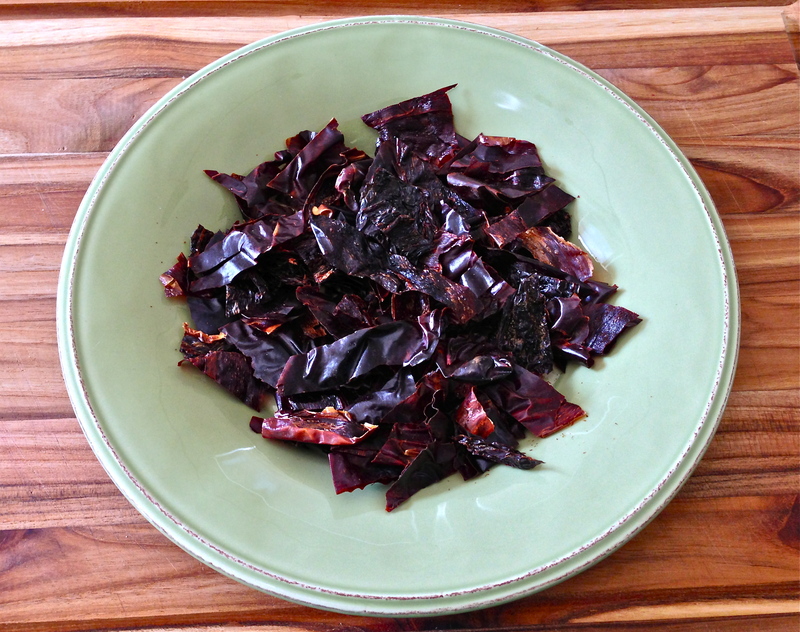 Searching around for chili recipes a few years ago, I landed on the controversy over Texas chili, which some aficionados claim must be chunks of beef with chili paste made from dried chilies. Tomatoes usually aren’t welcome; beans, never. Looking at pictures made me think of chopped brisket, or my other favorite slow-cooked cut, the short rib. 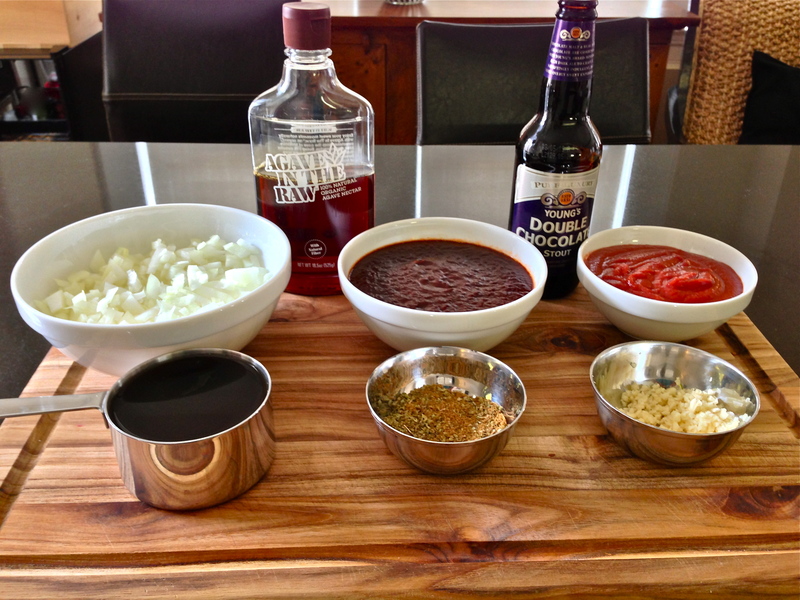 Since I’m an outsider and don’t need to be a Texas chili zealot, I could experiment. Giada De Laurentiis has a recipe for short rib chili that appealed to me, and it suggested serving it with polenta, which just made me think of Frito chili pie, so I had to try her version. I’ve since tweaked the recipe, substituting Young’s Double Chocolate Stout for the instant espresso coffee and dried chipoltes for canned, plus skipping her use of chocolate and adding tomato purée. 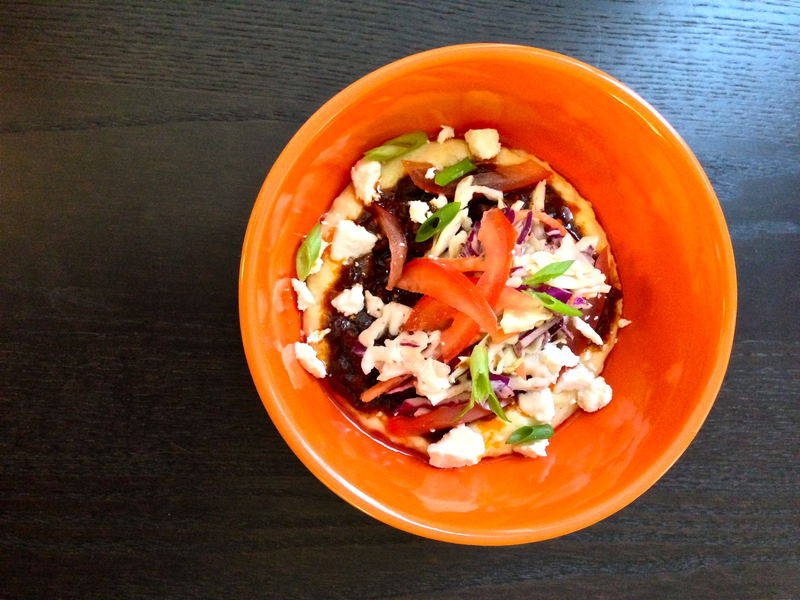 I serve the chili with regular creamy polenta and spicy coleslaw. Dried chilies are in abundance in Houston grocery stores. For my chili paste, I use a mix of 8 New Mexico chilies, 2 ancho chilies, and 2 chipoltes. They are seeded, sliced, and simmered in 1 1/2 cups of water until they are soft enough to blend with the liquid. 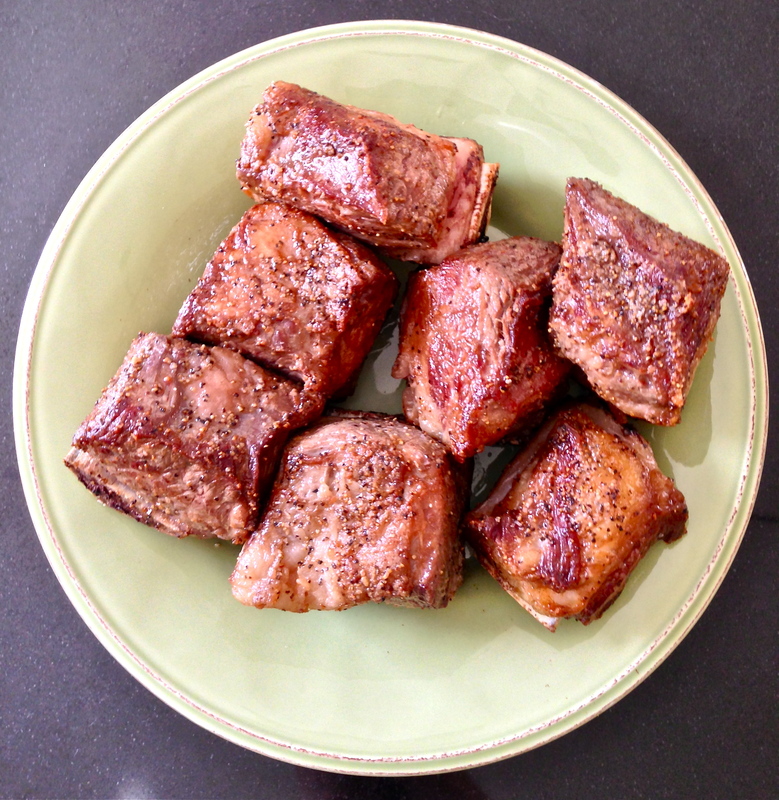 The 3 lb of short ribs are seasoned with kosher salt and cracked black pepper and browned in bacon fat. In the past, I have cooked off bacon in the dutch oven I use for the chili, reserving the bacon for a garnish. This time, the bacon became breakfast. I love the flavor of Young’s Double Chocolate Stout, and since I only use 10 oz, there is a little left over. After the ribs have been browned, I cook one diced yellow onion and six chopped garlic cloves in the dutch oven, adding the stout once the onions are soft. I reduce the liquid almost completely before adding the 1 tbsp cumin, 1 tbsp oregano, a 10 oz can of tomato purée, 2 tbsp amber agave syrup, and 1 cup beef stock. The short ribs are added back to the dutch oven, and once the mixture is at a simmer, it is covered and goes into a 325 °F oven for 2.5 hours. Halfway through, I flip the short ribs. When the short ribs are done cooking, remove the meat from the bone and cut off the tough membrane. The meat is chopped and added back to the chili after the grease has been skimmed. There will be a lot of grease. A can of black beans, rinsed and drained, can be added after the grease has been skimmed. Season with kosher salt and black pepper to taste. In the background is my sous-chef, Musetta, giving her best effort at a photobomb. 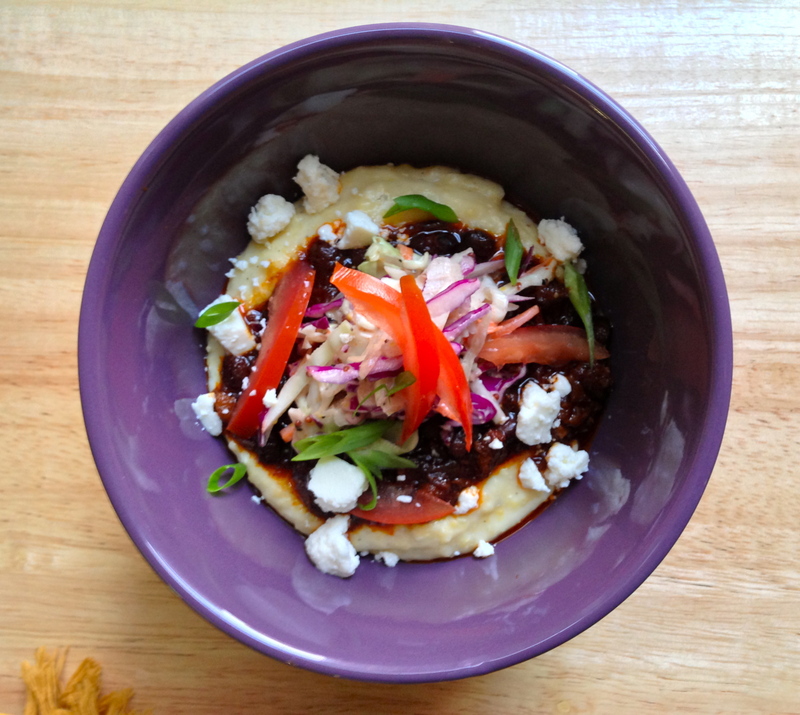 The chili is served over creamy polenta, and I top it with queso fresco, julienned tomatoes, scallions, and spicy coleslaw. The coleslaw is half of a head of purple cabbage and half a head of green cabbage, shredded; two peeled carrots, shredded; half a yellow onion, sliced thin and quartered; 1/4 cup mayo; 1/4 cup brown sugar; 1 tbsp dijon mustard; 1 tbsp whole-grain mustard; 1 tsp apple cider vinegar; 1/2 tsp cracked black pepper; 1/4 tsp ground cayenne; dash of hot sauce (optional); kosher salt to taste. This entry was posted on March 18, 2013 by Paul Otremba. 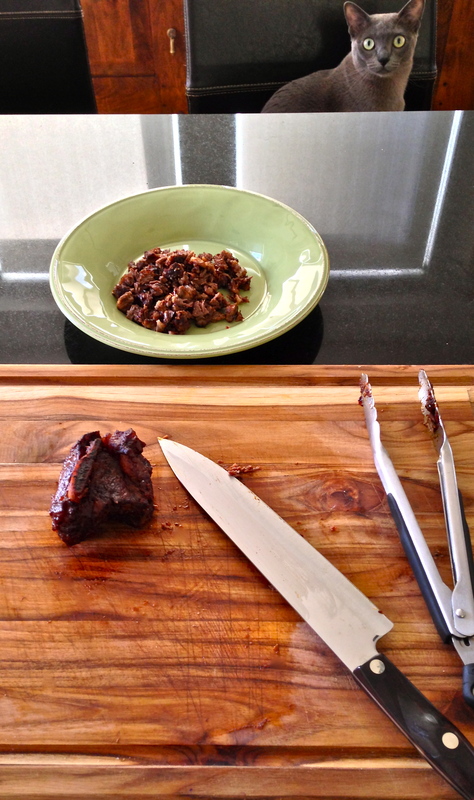 It was filed under Cooking Life and was tagged with Beef, Chili, Food, Recipe, Short Ribs.